Yesterday the air felt like winter was on the way, but it wasn't too cold for a walk at the Cummings Center Pond with the dog. I did think it was too cold to take pictures, however. I thought I would leave my gloves on and keep my hands in my pockets. And I did, until I saw the reflections of the trees and the sky on the water. So I got out my camera, took off my gloves, and took several photographs. Tonight did some cropping and adjusting with my laptop softwear. I think the photos I took yesterday have potential and I would like to do more with them. Perhaps over the next few days, I will get a chance to work with them in Painter IX, now installed on my brand new computer. 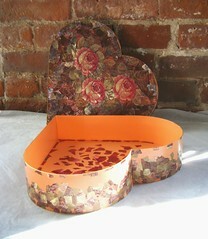 This morning a went to the studio for an hour and worked on this project, a heart-shaped box that I am covering with collage and decoupage created from printed metallic ribbons. The box itself once held a Mother's Day gift from my daughter. Today I concentrated on the outside of the box (the gold area), and was able to see some progress. Tonight I used my laptop Paint program to do another compositional exercise, this time using just the rectangle tool and the paint bucket fill. I was trying to create balance with the shapes and values. Even though this is just a geometric abstraction, the image was influenced by sad news from India that I have been thinking about today. I spent most of the day in the kitchen, cooking for Thanksgiving. I started by making cranberry-orange relish. 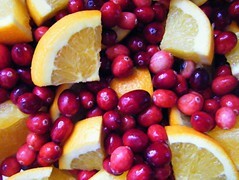 I like cranberries and oranges together, not just the tastes, but the colors and textures. So before I threw the cranberries and oranges in the food processor, I put them in a bowl and took this picture. Tonight I cropped the image a bit to get this composition. 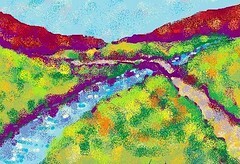 This is a landscape that I created late today using the Paint program on my laptop. 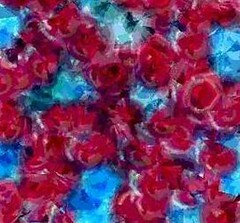 I used the brush and spray paint tools over "paint bucket fill" to get this texture. I called this November fantasy because the image comes from my imagination, influenced by the little "over the river and through the woods" song associated with Thanksgiving. Well, in this picture, there is no snow, no sleigh, no horse and no grandfather's house. There's just a road leading home, traveling through the foliage of New England, and heading west. Here is just one more of the abstract digital drawings that I made on my laptop Paint program. I did this one last night, using just two curved lines. This looks simple, and it is. But this was great practice in the basics of composition because what really makes or breaks an image like this is the placement of the lines to create harmonious and pleasing spaces. Well, in any case, the exercise pleased me, and it is nice to have a set of three images. This is another of the digital drawings that I made last night with my laptop's Paint program while I was trying out the curved line tool. 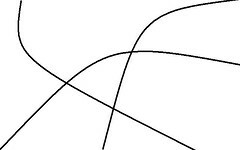 I created this composition with four curved lines. 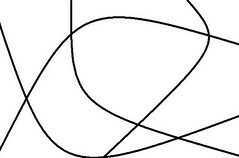 It is interesting to see how four simple lines can create such complicated shapes when they intersect. Tonight I was exploring the paint program on my laptop, and decided to try out the curved line tool. I made several attempts at images, some of which I deleted, but succeeded in creating two digital drawings, both abstract. 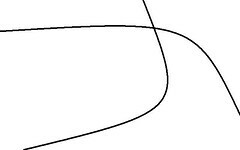 I think this is the best composition of tonight's little exercise, and the simplest, using only three curves. Despite the simplicity of the image, this was good practice using a new tool, and even better practice at composition. Yesterday I went to the studio as early as possible to fit in an hour working on this project. 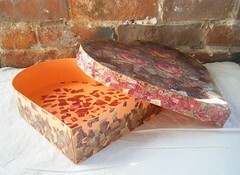 I am covering this heart-shaped box with decoupage and collage patterns. My materials are the box, which originally contained a Mother's Day gift from my daughter, and printed metallic ribbons, given to me by a friend. I am using acrylic medium for the glue. Yesterday I worked on the outside of the box. I can see some progress as the pieces of gold-colored ribbon climb up the sides. This is the third (and last) of three photos that I took during a recent supermarket run. 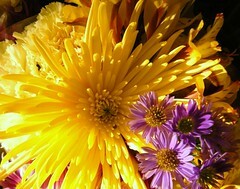 It was late afternoon, and I noticed some supermarket bouquets. 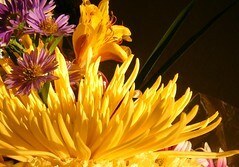 The yellow flowers were beautiful in the late afternnoon sunlight coming in through the store windows. Later, I cropped the photos, using the basic photo editing in my laptop. In this shot, you can see a little bit of the cellophane wrapper in the lower right corner. I didn't crop it out because it seemed to work with the composition. This is the second of three photos that I took yesterday during my late afternoon grocery store run. The display of flowers in front of the cereal aisle took me by surprise. Just grocery store flowers, perhaps, but they looked amazing in the late afternoon light streaming through the plate glass windows, so I took some pictures with my digital camera. Last night I edited the three photos with basic software in my laptop. Tomorrow I will post the third photo. . . .
Late this afternoon, I realized that I still needed to go to the grocery store to pick up a few things. I think I was heading for the cereal aisle when I saw a small display of flowers. 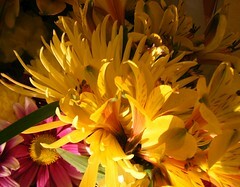 All the bouquets were predominantly yellow, and they were gorgeous in the late afternoon light of November. I stopped in my tracks, got out my digital camera, and took some photos. Tonight I used the Microsoft photo editor in my laptop to adjust the brightness and crop the photos, for composition and to eliminate the grocery store tags and labels! This is the first of three photos. More to come tomorrow. . . It was cold today, with temperatures in the thirties. It didn't feel like walking weather, but if you live in Massachusetts, you just have to get used to the cold and keep going unless you want to stay inside all winter (and I don't). The destination today was Long Hill Gardens here in Beverly. Well, it is too cold even for the hardiest flowers, and most of the leaves are gone, but even so, there is always something to see at Long Hill. 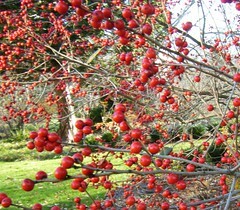 This afternoon I saw this shrub full of bright red berries. It looked like a candy tree, so I took some pictures. Tonight I transferred the photos into my laptop and edited them with basic Microsoft tools. This is the composition I liked best. I went to the studio early this morning to work on this project for a while, a heart shaped box that I am covering with collage and decoupage. I am very busy this week, life is hectic, and my desktop computer is a goner. Good reasons not to go to the studio? No, good reasons to make time to make art, even if it is just for an hour. When I make time for art, I am happier and more productive for the rest of the day. Today was cold but bright and sunny in the studio. 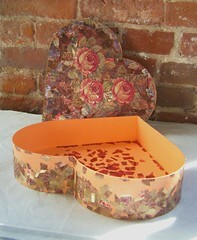 It was fun to see the sunlight play on the printed metallic ribbons on the sides of the heart-shaped box. I took this photo last week during a walk on the Beverly Commons (a small park near the center of town). 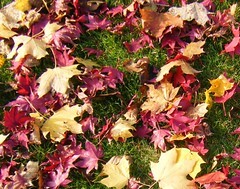 I loved the look of the colorful autumn leaves against the bright green grass, so I took some pictures. Today I cropped the image to get the composition I was after. I was very happy to be able to post this photo! Although my main computer is still on the fritz, its hard drive is attached to and accessible through my computer, and that is how I was able to post this photo here today. 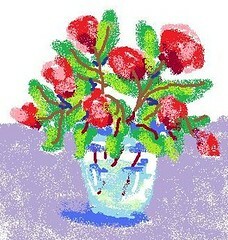 Tonight I made another still life using Microsoft Paint on my laptop. (Yes, my main computer is still broken.) I have been enjoying making these digital sketches, so I decided to do one more. It's great practice and lots of fun. This image is drawn from my imagination (and memory, because I often draw from observation.) I used three tools: digital spraypaint, digital brush, and digital eraser (to get the reflections in the glass). My main computer is not yet fixed, so tonight I decided to use the Microsoft Paint program in my laptop to make another digital sketch. 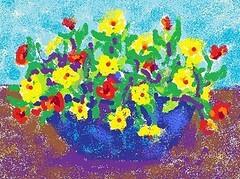 This is another still life created from my imagination. It was fun to draw this little digital sketch, and very good practice. Today began with a computer crash first thing this morning, and the day seemed to head downhill from there. At this point, my (main) desktop computer is now useless and awaiting a new fan, which I hope will solve the problem. Much of the day was spent getting set up to do basic operations on my laptop until my main computer is working again. I was wondering how to post here today. (No Painter IX on my laptop!!!) So I explored the laptop, looking for a basic paint program. I found Microsoft Paint, and started to sketch. It's a good program, simpler than Painter IX, so I decided to see what I could do. I thought I would keep it simple, and started sketching a little still life from my imagination. At first, I was having trouble controlling the 'mini-mouse'. But I tried switching from the digital brush control to digital spray paint, and things began to fall into place. As I worked, I began to relax for the first time today, and I am happy to have made this little sketch. It helped get me past the frustrations of the day, and reminded me to focus on what is working and what I have, rather than what is missing and what is broken. That's important in art, and even more important in life in general. This morning I went to the studio to work on this project for a while. The heart-shaped box originally contained a Mother's Day gift from my daughter. 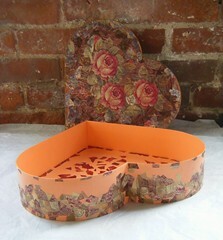 Now I am turning it into a keepsake box, covered with collage and decoupage made from printed metallic ribbons. Today I worked on the outside of the box (the gold area). I made some headway on the top rim and also filled in some gaps around the side. I also did a little bit of work on the red area inside. I really enjoyed the time, short as it was! My studio was filled with sunshine this morning, so bright that it was hard to see (like driving into the sun), but wonderful light! 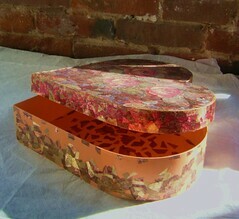 In this photo, you can see how the heart-shaped box looks when the sunlight plays on the golden ribbons. 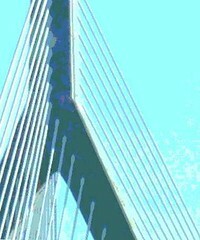 This image is a close-in crop from the photo of Boston's Zakim Bridge that I posted here yesterday. Zooming in this way shows off the stunning geometry of the bridge. I cropped the image to find a format and composition that would emphasize the beautiful lines of this structure. I also posterized the image using my Painter IX program. Yesterday the weather was beautiful, perfect for an early run into Cambridge for coffee, a Nutella crepe, and then bookstores. 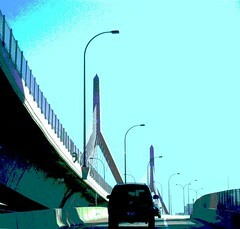 This is the view on the way, the access lane onto the Zakim Bridge. I love this bridge, and keep always trying to get a good picture of it! It's not easy to do, especially from a moving car (passenger seat, of course). This picture wasn't taken during yesterday's trip to Cambridge. 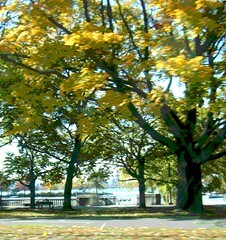 I took this picture two weeks ago on October 27th, during a drive into Boston to have lunch with a friend. But inspired by yesterday's excursion, last night I cropped and posterized this photograph in Painter IX. Last night I used my Painter IX program to create this digital mosaic. Except for the tutorial when I first got the software (back in 1996! 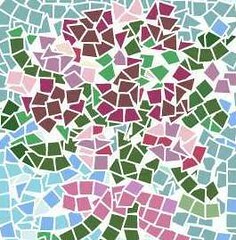 ), I have never attempted a mosaic in Painter. (And there have been several new versions since then, anyway.) So it took me a while just to figure out how to do it. 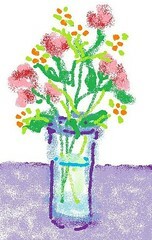 To keep the content simple, I started with the idea of a bouquet of flowers, and worked from my imagination. Here is the result. This was more of an exercise than an attempt at a finished piece, but it was fun to make this little mosaic on the computer. This is another of the photographs that I took here in Beverly, MA, on November 4, Election Day. There were pockets of fog early that morning because the weather was unusually warm. I took this photo later that day, during a late morning dog walk at Lynch Park, and by then, distant outlines were still softened by the fog, even though much of it had burned off. I was very excited but also apprehensive about the outcome of the election, and it was good to take a walk and relax. I took this picture when I was standing on the beach, looking north towards the small lighthouse at Hospital Point. 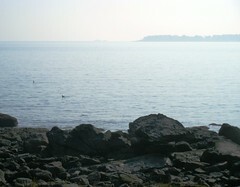 The effects of the fog are still visible in the diffuse light in the distance, although the rocks in the foreground can be seen quite clearly. I liked the combination of the rocky coast, the lingering fog, and the lighthouse, visible in the distance. 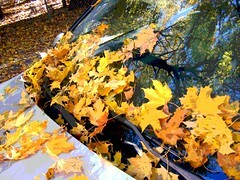 Lately, when I leave the house in the morning, my windshield is covered with leaves, and I have to clean them off before I can drive, just as if it had snowed. It makes me laugh every time, and I love to look at the leaves, so I took some pictures. I like this view because you can see the reflection of the trees in the windshield. I opened the image in Painter IX and used some digital pastel to clean up some marks and tears in the leaves, just in places that were distracting, and then I posterized the image. Early yesterday morning, I went up to the studio to work on this project, a heart-shaped box that I am covering with collage and decoupage made from printed metallic ribbons. I am still working on the outside of the box (in gold) and the red area inside. I am starting to work on the border around the top, as well as fill in the sides. I can see some slow progress, with the emphasis on slow. But yesterday, nothing had the power to discourage me! Patience, and persistence pay off, and small steps can lead to big goals. That's true in art, true in elections, true in life. It was warm all day today, good weather for voter turnout and for standing in line! On the way to vote this morning, I noticed pockets of fog in low-lying areas along the way. 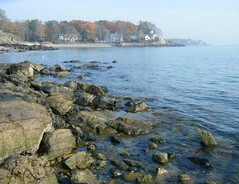 By late morning, it was warm enough for a walk at Lynch Park with the dog. Although much of the fog had burned off, it was still having an effect, softening the view of the horizon with diffused light. This seemed a fitting image for the way I feel on election day, knowing that change is coming, but not yet being able to see clearly what that change will be. Today I went to the local car wash so I could vacuum the inside of my car. Tomorrow I am providing rides to the polls for my political party. I don't want to get too political here, so let's just say that my candidate is That One '08. Anyway, a family member suggested that unless I cleaned out my car, the result would be voter suppression rather than getting out the vote. So that's how I ended up outside the car wash on a chilly, overcast November afternoon. This car wash is located right next to the Bass River, with nothing at all obstructing the view except for a low fence. So while I spent my sixteen quarters (yes) on vacuuming for change, I noticed the view. When I was finished cleaning out the car, I took out my camera and walked the four feet over to the river bank and took some pictures. 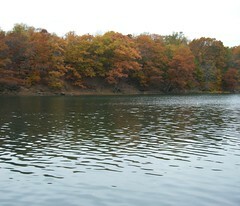 The overcast weather changes the color scheme, bringing out the subtle burnt orange and bronze colors of early November. This image began with a photo of my parents that I scanned into my computer a while ago. It looks like they were out for the evening. When I was little, if they said they were going to a party, I always begged to go along too, so after a while, they began to tell me that they were going to a meeting instead! My uncle was a wonderful photographer, and it is possible that he took the photo. In any case, this piece is a collaboration with whoever took the photo. When I found this image tonight, I realized that I had already begun to work on it some time ago, so I decided to finish it. I had already simplified the background with Painter IX. So tonight I reopened the image and used digital pastel to clean up some scratches. In the original photo, my mom's eyes were closing just a bit. (She hated the flash of camera lights.) So I also used digital pastel to fix that problem, as well as some wayward locks of hair! Then I posterized the image, using the magic wand tool to select the areas. 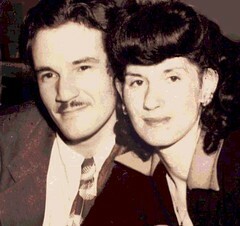 Well, I enjoyed working on the image tonight and spending time thinking about my parents. It made me smile to think that when this picture was taken, they might have been out celebrating her birthday, which was November 2nd. Whatever they were celebrating, tonight I got to tag along! This image is from a photo I took during last week's excursion into Boston. I like going to Boston, and I even like the drive to get there. Storrow Drive is one of the main roads through Boston. 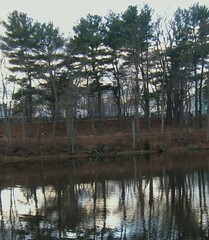 It winds along the Charles River, and the scenery is great! But Storrow is also very challenging to drive: Boston traffic, curves and reverse curves at highway speed, city traffic, and lots of tricky entrances and exits. When I am driving, there is zero opportunity to admire the scenery, unless traffic comes to a complete standstill (which sometimes happens). But during last week's trip into Boston, I was in the passenger seat, so I took plenty of pictures. I love the view of the river along the way, and last week the October colors were great. I took some photos as we moved along (and you can see a bit of the motion in the photo). Tonight I trimmed the image and posterized it in Painter IX.